The Tu Duc Royal Tomb in Hue, Vietnam is one of several Royal Tombs in the outskirts of the former Imperial Capital. was built between 1864 and 1867, and was designed as a tribute to the fourth Nguyen Emperor’s long and somewhat sad life. Tu Duc struggled with rebellion, French encroachment, and court intrigues for thirty-odd years (Tu Duc is the longest-reigning Nguyen Emperor on record). Towards the end of his life, the Emperor retreated into his tomb, creating a fantasy-land where he could compose poetry, hunt, and console himself through his concubines. No other Royal Tomb in Hue can compare to Tu Duc’s in the department of size and luxuriousness. The tomb’s architecture was designed to work in harmony with the carefully-manicured landscape. The Emperor used this site as his home away from home, so everything had to meet the Emperor’s exacting specifications: a sprawling 30-acre manor that could accommodate the Emperor and his entire retinue; pine forests and manicured grounds where the Emperor could walk undisturbed; pleasure pavilions where the Emperor could write verse; and a lake with its own small island, where the Emperor could hunt miniature animals if he so wished. For all that, the Emperor affected humility as his end neared, adding the word Khiem, or “modesty”, to all the building names in his tomb complex. The tomb site and its buildings are relatively well-preserved despite the ravages of war and time, and serve as a reminder that money and power can only buy one so much happiness. Getting to Tu Duc’s tomb: the site is four miles from Hue, and is served by package tours, xe om, and cyclo drivers from the town center. For more on each method and their prices, consult our article on How to Visit Hue Royal Tombs. Operating Hours and Admission Fees: As of April 2015, admission to Tu Duc’s Royal Tomb costs VND 100,000 for adults, VND 20,000 for children under 12 years of age, to be paid at the gate. (Read about Money in Vietnam.) The Tomb is open from 8:00am to 6:00pm. Must Haves: parasol, sunglasses, and a bottle of water in the sunny season during April-September, and an umbrella and raincoat/jacket during the rainy months of October-March. (See our Weather in Vietnam article to find out more.) Wear comfortable shoes – you’ll do a lot of walking through the tomb’s sprawling grounds. Find out about getting a visa to Vietnam, and how a US passport does against other Southeast Asia countries. An octagonal wall encloses Tu Duc’s Royal Tomb; tourists enter through the ornately-bedecked Vu Khiem entrance (where the VND 100,000 entrance fee is collected). Upon entering the compound, you will first walk north about 400 feet down a pavement created from ceramic tiles (sourced from Bat Trang village, the source of Vietnam’s finest ceramic wares). The path skirts Luu Khiem Lake on your right; stop at the midpoint between Khiem Cung Gate (the passage to Hoa Khiem Palace – more on that later) to your left, and Du Khiem boat landing to your right. There are two structures on the near shore of Luu Khiem Lake – Du Khiem boat landing and Xung Khiem pavilion, both of which are partially visible in the image above (Du Khiem is the structure closer to the camera; Xung Khiem is the pavilion some distance off). More info on both structures follows on the next page. The image above shows the view from Xung Khiem Pavilion, one of the Emperor’s pleasure pavilions on the grounds of his royal tomb. The pavilion overlooks Luu Khiem Lake, a man-made lake built for the pleasure of the Emperor. Xung Khiem Pavilion, a pleasure pavilion where the Emperor could sit at his leisure with his concubines, writing verse and reading their compositions. The restored pavilion is now sturdy and elegant enough to host poetry reading competitions again – you’ll have to bring your own concubines, though. To reach Xung Khiem Pavilion, you’ll have to walk north about 100 feet from Du Khiem boat landing, then turn left and walk 100 feet due east and you’ll reach the pavilion. 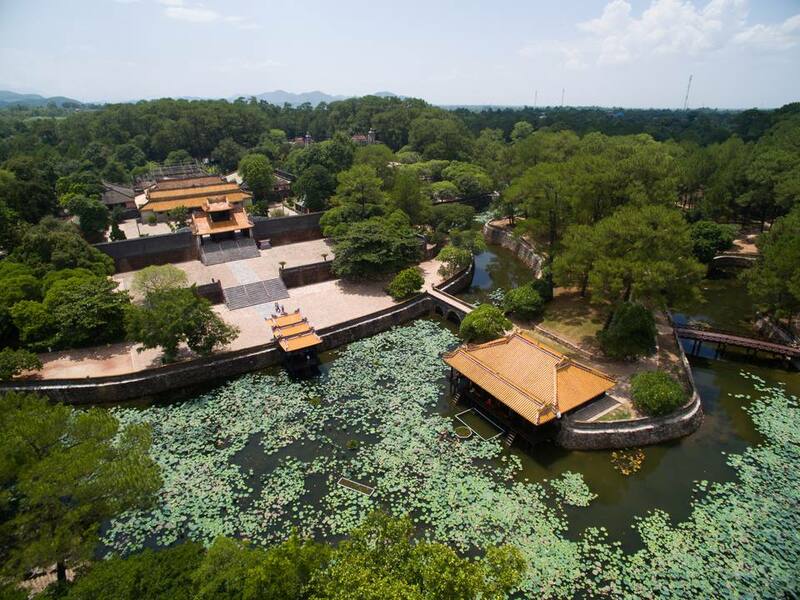 Du Khiem boat landing stands closer to the palace - a covered landing where the Emperor could disembark after his hunting trips to Tinh Khiem Island in the middle of Luu Khiem lake. The island was stocked with small game – tiny deer, cats – that the Emperor could hunt at his pleasure. Du Khiem is directly opposite the palace gate. Khiem Cung Gate is directly opposite Du Khiem boat landing. The boat landing, the gate, and the palace behind the gate are all arranged on a single axis. Khiem Cung Gate leads into the courtyard preceding Hoa Khiem Palace, the Emperor’s residence when he was visiting. After his death, the palace was converted into a temple where the Emperor’s memory was worshipped. Many of the Emperor’s personal effects can also be found here, such as a clock gifted by the French government and two thrones used by the royal couple (interestingly enough, Tu Duc was considerably smaller than his Empress – he used to occupy the smaller one of the two thrones). Construction of the Palace and the other parts of the tomb complex were undertaken between 1864 and 1867. The labor and expense involved in the construction of Tu Duc’s royal tomb was a source of much tension between the Emperor and his people – the forced labor of 3,000 workers and additional taxes extracted from the villagers precipitated a coup attempt against the Emperor (which failed). Luong Khiem Temple, directly behind Hoa Khiem Palace, was a center of worship for the departed soul of Tu Du, the Emperor’s mother. Minh Khiem Chamber, behind and to the right of Hoa Khiem Palace, was used as a theater for the entertainment of the Emperor and his retinue. The Emperor was devoted to classical Vietnamese drama, and sponsored the publication of hundreds of dramas, supposedly for the edification of his people. The art of Vietnamese theater reached its apex in Tu Duc’s reign, as about three hundred actors and actresses were summoned to the capital to serve the Emperor’s entertainment needs. For a nominal fee, visitors may dress up as the Emperor (and his Empress) and pose for souvenir pictures; employees are also on hand to pose as mandarins in the picture. You may exit the Palace the way you came. Once you arrive at the brick path outside Khiem Cung Gate, you may proceed about 500 feet due northwest till you reach the forecourt preceding the Stele Pavilion, the easternmost node of a second axis along which the Necropolis buildings are arranged. This axis lies parallel to the first line where the palace and the boat landing lie. The forecourt is lined with the usual honor guard of horses, elephants, and mandarins. The mandarins are smaller than usual – this was on purpose, as the Emperor was a diminutive man. Walk between this honor guard and you’ll reach the first building in the Necropolis: a Stele Pavilion housing a 22-ton stone tablet (stele) inscribed with the Emperor’s biography. As the Emperor had no son, he wrote the text on the stele himself, which was considered a bad omen for the dynasty. The self-written biography takes pains to be modest, recalling his life and his illnesses, and admitting the possibility that Emperor may have erred along the way. Tu Duc’s stele is the largest in Vietnam – the effort of bringing it from Thanh Hoa to Hue (a 300 mile journey) took four years. Two towers flank the Stele Pavilion – these obelisks are another common sight in Royal Tombs, as they represent the emperor’s power. Walk 200 feet to the west, and you’ll reach the ultimate point in the Necropolis: the Buu Thanh brick wall that encircles the Emperor’s sepulcher. The tomb is a simple structure that, almost alone among this Imperial Tomb’s structures, is designed in a simple and unassuming style. The Emperor is not buried under this tomb. Instead, when Tu Duc passed away, he was buried secretly somewhere in Hue – nobody knows where, as the mandarins beheaded the 200 workers who buried the Emperor (and buried the treasure that usually accompanied imperial funeral rites). To this day, nobody knows where Emperor Tu Duc is really buried – that’s a mystery for another generation to solve. Tu Duc’s adoptive son Kien Phuc took the reins of the Dynasty, but died only seven months after taking office. Kien Phuc was buried in Tu Duc’s tomb complex as well, his grave occupying a small site about 500 feet north of the Xung Khiem Pavilion, across the lake from his adoptive father. Tu Duc’s wife the Empress Le Thien Anh is also buried across the lake at the extreme north of the compound, at a site 500 feet west of Kien Phuc’s tomb.